Select seven favorites from the artist's Sand Bank, or send in your own from an unforgettable spot. There's the coast you make it to every summer, the ones you've been lucky enough to sink your toes into, and those you've yet to check off the once-in-a-lifetime list. 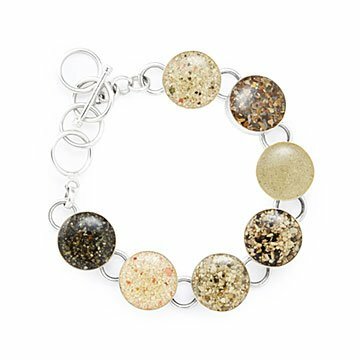 Stay reminded of your happy places with Holly Daniels Christensen's custom sand charm bracelet. The sterling silver bezels display a pinch of granules gathered from your choice of thousands of beaches around the world. Select seven favorites from the artist's Sand Bank, or send in sand you've collected from unforgettable spots. Handmade in Massachusetts. You can polish your bracelet with a silver polishing cloth then use a soft cloth or brush with soap and warm water to remove the polishing residue. If the "sandy" part of your bracelet becomes scratched or cloudy, buff with car or boat wax. Our mother commented that it is beautiful, a wonderful piece for remembering family times together. She also notes it is a great conversation piece. I was impressed by the number of beach/sand choices. The bracelet is beautiful and unique. What I couldn't tell from the photo is that the beads are flat. Still beautiful, just not entirely what I expected.they are also a bit larger than expected. Beautiful Bracelet & Fabulous Gift! This is a stunning bracelet and made with great quality. You can tell it was made with great care. Its a great talking piece and looks fabulous on! The most unique gift I've ever purchased! I was disappointed that I did not get sand 1085 - received another Hawaii sand instead.